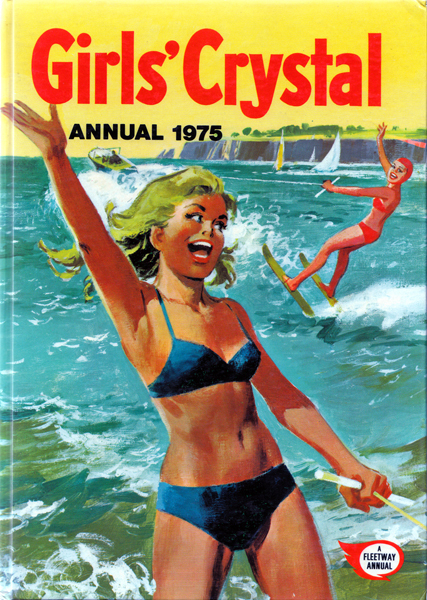 Description: Packed full of picture stories and comic strips – the vast majority of which are b&w, with only a handful in red monochrome – plus general interest articles including royal residences, historical mysteries, famous monuments, the origins of musical instruments, confectionary recipes, a horoscope for 1975, and even instructions for making a 'smart smock'. The puzzle page has been completed. Glazed pictorial boards are in excellent condition for their age. Minor bumping to top corners and tail of spine. Pages are tanned, but remain in superb, unmarked condition. Unclipped (bears original price of 80p). Super-tight binding. Measures 27 cm × 19 cm (10.8″ × 7.5″). 4to. 159 pp.